Clio & Phineas: Bluberry Muffins with a Side of MPB Day! Bluberry Muffins with a Side of MPB Day! Sewing meet ups are the best because of the other sewists! Where else could I talk about hand-worked buttonholes or finding the perfect sweater knit or the merits of hair canvas with people who get as giddy as me over it? 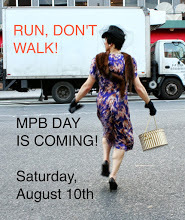 Those of you who were there, I think it's time to petition the government to make MPB Day a national holiday. Are we agreed? And those who didn't make it, well, I'm sure that there will be re-caps aplenty in the next few days. Thank you, Peter! What a great day! One of the reasons I post my favorite recipes here is that a blog makes an excellent mobile cookbook, complete with the little tweaks I made and suggestions for future batches. When Phin came home with a small mountain of blueberries a few weeks ago, I was surprised to not find my go-to blueberry muffin recipe on the blog. It's from the White Dog Cafe Cookbook and has been a favorite of ours for years. In fact, this recipe came with Phin when we moved in together aeons ago. Preheat oven to 400. Combine dry ingredients. Whisk together wet ingredients. Mix the two together and then fold in the berries. Scoop batter into greased muffin tins - fill just to the rim. Bake for 30-35 min until just starting to brown. Cool 5 min and remove from pan. The recipe says it makes 12, but I think those must be using enormous muffin tins since I usually get about 18 in my muffin/cupcake tins. I also bake for more like 25-30 minutes. Also, I am newly converted to the idea of using cupcake cups for muffins instead of greasing the pan. It makes it infinitely easier to get the muffins out of the tins without mutilating them. What I like best about this recipe is that it has loads of blueberries. I hate a blueberry muffin that skimps on the berries. This is more like berries bound together with a little muffin, rather than muffin with a few polka dots. In my most recent batch, I had about 1/2 cup extra blueberries, so I tossed them in. A few of the muffins actually collapsed under the weight of the berries. So, in the future, I will probably stick to just 3 cups. My only other innovation was that I made a half batch of this previously blogged crumb topping and sprinkled it on before popping in the oven. Perfect! I should also add that I've used regular all purpose flour, part "white" whole wheat flour, and part whole wheat pastry flour in the past when I haven't had cake flour and it's worked out fine. So is using milk and vinegar instead of buttermilk. It's a pretty forgiving recipe. Anyway, this is another TNT recipe for me. I just love summer baking! Do you bake in the summer? Nice seeing you yesterday! Good job restraining yourself on fabric purchases. And I agree, more blueberries! I haven't turned the oven on once this summer, but this would be a tempting reason! If you take some of those blueberries, boil with a little sugar to make a sort of soft jam, put a tsp of the jam on the top of each unbaked muffin, this will intensify the blueberry flavor. This actually was a recipe from Cooks magazine last year, I think. I know what I'll be trying in the next batch! What a great suggestion! It was great to see you too! Honestly, I was fighting off a bit of a migraine for most of the afternoon, so decision-making on fabric was a no-go. I actually may go back and buy one of the sweater knits I saw at Mood now that I'm in a clearer mindset. I always bake. I don't like store bought bread, (excepting of course artisanal bread which costs over $5 a loaf) so I make almost all of the bread I eat. Other baking doesn't happen as often. However I did make a batch of lemon ice cream yesterday. It is quite tasty. I think I will make peach ice cream next. Oh no! I hate to rain on anyone's giddy! I'm not near White Dog. Phin's brother went to UPenn and, well, I don't really know the story but that's somehow how he came to own the cookbook. That said, if there was a meet up in Philly, I could potentially make a day trip out of it. I've recently started trying my hand at yeast risen breads. None have come out well enough to post, although they were tasty. Do you have a favorite book or books or recipes?? Yes! I'm glad you and Charlotte and co made it! Thanks so much for this! Sweater knits here I come! fair enough. maybe I'll stop being a lump and organize something. Bberry scones are definitely tasty! Yum! Yum, they look delicious. I love to bake all year round, but incorporating summer fruit into cakes and muffins is a particular joy. It makes them healthy *wink*. I use my sewingblog as a recipe file too. He he he, I tell myself that, too! How could in-season fruit be anything less than virtuous? Yes and no. helpful aren't I? This is the link to the yes portion. There is also a video on how to make this recipe. It is wonderful and won't last long, which can be bad for one's waistline. The no part of my answer, is that I have been making my bread for so long that I don't use a recipe anymore. I will try to find the original of my recipe and actually write down my variations and maybe do a post on my blog. Thanks for volunteering to be our group's tour guide to Mood- it was great meeting and chatting with you and you have inspired me to try my hand at much finer sock yarn in my next pair - the blue sock you showed us was stunning. Ha ha. And here I've actually been thinking about doing a chunky slipper sock after seeing yours! I guess this is how good ideas spread! Are you on Ravelry? You can find me there as Cliobklyn. It was great to see you on Saturday! Really fun to see yours and everyone's outfits and recognize them from their blogs. This was my first big meetup, and it made me want to do more!! I'm going to post my short recap tomorrow. I got home and realized I barely took any photos. Oh well. Here's to national MPB Day!! Yes! Isn't that the best - when you get to see someone's outfit in person? I was glad you turned up - sewists are the best! See you soon! I'm a few days late, but it was great meeting you at MPB Day! It was a very inspiring day, and I have already been sewing again! Self Drafted Pencil Skirt Muslin of Triumph!! On My Way To MPB Day! Finished! Wax Cloth Skirts for My Sisters!